Bernd Leno has remained the Gunners' first-choice goalkeeper since the beginning of October and the German should retain his position between the sticks for the Merseyside trip. In the defence, Unai Emery may switch to a three-at-the-back formation to curb the Reds' attacking threat and this may witness Stephan Lichtsteiner potentially dropping to the bench for the younger Ainsley Maitland-Niles. 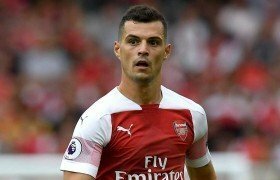 In this case, Maitland-Niles and Sead Kolasinac could take up the right and left wing-back positions respectively while Granit Xhaka may accompany Laurent Koscielny and Sokratis at the heart of the club's defence. Meanwhile, Mateo Guendouzi and Lucas Torreira are pretty much constants in the midfield, based on the manager's recent selection and the duo should feature from the off without any concern after narrowly escaping the yellow card limit at the halfway stage of the season. Further forward, Aaron Ramsey could be handed a rare league start alongside Alexandre Lacazette in the attack and we are predicting the pairing to feature behind Pierre-Emerick Aubameyang, who is leading the Premier League scoring charts this term with 13 goals.